We aim to put up a new challenge every month, the aim of these challenges is to help people form healthy training habits and also to build on some traditionally weak areas for people, or just for a bit of fun. We will post a few loose rules but for the most part it’s about fun and you can run with it however you want. January’s challenge is all about the Squat, the king of exercises. 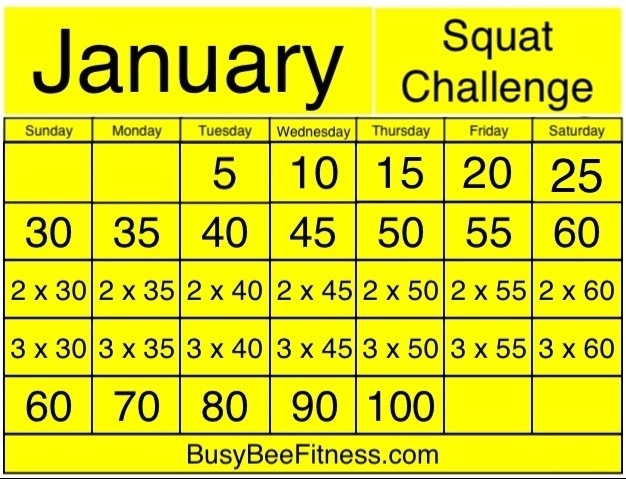 Basically you just do the prescribed number of squats each day, do them all and you’ll be up to 100 by the end of the month and you’ll have completed 2365 squats during the challenge. Beginners or people already partaking in workout program’s then we just recommend doing body weight squats and nothing more. Advanced – Weighted squats all the way, you don’t need us to tell you how much weight I’m sure. Just ‘like’ us on Facebook and comment on the photo posted on there. I pay a visit every day some blogs and sites to read articles or reviews, except this webpage gives quality based posts. Will you be joining us in the challenge?? getting knowledge every day by reading such nice articles. Will you be joining us in the challenge ?? Well I woke up bright and early and did my 5 body weight squats. check out my website as well and let me know how you feel. issues with your RSS. I don’t know the reason why I am unable to join it. Is there anybody having similar RSS problems? Anyone that knows the solution will you kindly respond? Thanx!! who are not afraid to mention how they believe. At all times follow your heart.